Heavyweight contender Gerald Washington did all the right things to win his last bout in June, his unanimous decision over John Wesley Nofire ending a two-fight losing streak. Washington (19-2-1, 12 KOs) won a clash of 6-foot-6 behemoths over Nofire (20-2, 16 KOs), rebounding from back-to-back stoppage losses in the fifth and eighth rounds to 6-foot-7 WBC heavyweight champion Deontay Wilder (40-0-1, 39 KOs) and 6-foot-4, 300-pound Jarrell Miller (23-0-1, 20 KOs) in February and July 2017. “Nofire was 20-1 with a lot of knockouts, and he came to fight,” said Washington, who is training at Boulevard Boxing in Reseda, California, and entering his second fight with trainer Shadeed Suluki. 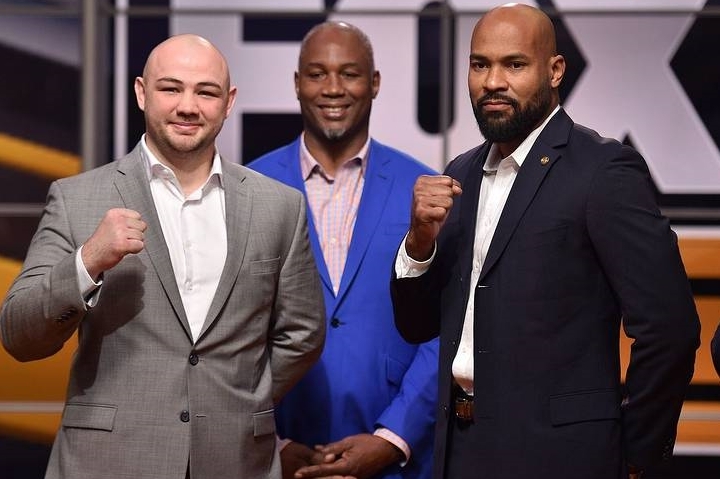 But “The Black Rooster” returns to the site of his loss to Miller on January 26 at Barclays Center in Brooklyn, New York, when he battles 6-foot-3 Adam Kownacki (18-0,14 KOs) as Premiere Boxing Champions returns to FOX (8 p.m. ET/ 5 p.m. PT.). Washington-Kownacki is appearing on the undercard of WBA “super” welterweight champion Keith “One Time” Thurman (28-0, 22 KOs) ending a 22-month, injury-caused ring absence with his eighth defense and third straight and fourth overall appearance at Barclays against third-time title challenger Josesito Lopez (36-7, 19 KOs). “I’m actually grateful to Big Baby Miller for exposing some things that I need to work on,” said Washington, a 36-year-old U.S. Navy veteran and former collegiate football player who began boxing at age 30, turned pro after 14 amateur bouts, and was 18-0-1 with 12 knockouts when he challenged Wilder. Kownacki won his toughest and most difficult challenge by unanimous decision over left-handed former IBF heavyweight titlist Charles Martin (25-2-1, 23 KOs) before his boisterous partisan Polish fans at Barclays in September. The 29-year-old Kownacki’s run of four straight knockouts ended against Martin, who followed “Baby face’s” one-knockdown, fourth-round TKO of left-handed former title challenger Artur Szpilka in July 2017 and his sixth-round knockout of previously once-beaten Iago Kiladze in January. Kownacki’s stoppage of Szpilka was quicker than his Polish countryman was dispatched by both Wilder and title challenger Bryant Jennings in the ninth and 10th rounds, and Kiladze’s streak of six straight wins, five by knockout, was ended. Kownacki estimates he’s sparred “more than a thousand rounds” with Miller, the man he will train with to prepare for Washington. “I know he and Baby Miller are friends,” said Washington of Kownacki, who is 7-0 with four knockouts in Brooklyn, where he has lived since moving from Poland as a youth. Washington prepared for Wilder by sparring with 2012 Olympian Dominic Breazeale, a 6-foot-7 loser by seventh-round title fight TKO to Anthony Joshua in June 2016. Washington trained for Miller through sessions against Wladimir Klitschko in advance of the former long-reigning unified champion’s 11th-round TKO loss Joshua in April 2017. Washington out-boxed Wilder early and was even on two of the three official scorecards after four rounds before “The Bronze Bomberr” dropped him once in advance of the stoppage. “Deontay Wilder was one type of style, but Big Baby was a completely different style that I didn’t understand,” said Washington, who was undone by Miller’s juggernaut-like pressure and aggression. Washington served as a helicopter mechanic in the Navy from 2000-04 and achieved the rank of petty officer third class. He enrolled at Chaffey Junior College in Rancho Cucamonga, California, earning a spot on the football team despite having played just one year in high school. After earning a variety of honors in his two years at Chaffey, Washington transferred to the University of Southern California, where he played both tight end and defensive end in 2007 and 2008 for teams that went a combined 23-3 and finished in the top three in the country both years. Following stints on the practice squads with the NFL’s Buffalo Bills and Seattle Seahawks, Washington turned to boxing.